Crossens station was on the West Lancashire Railway (WLR) Company’s Southport & Preston Railway which opened in stages between 19 February 1878 and 6 September 1882. The WLR was promoted by Sir Thomas George Fermor-Hesketh, Bart. Royal Assent was given for the ‘West Lancashire Railway’ on 14 August 1871. 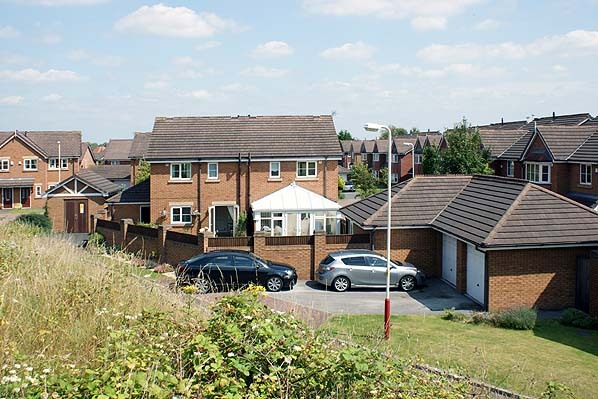 The Act authorised construction capital amounting to £150,000. James Brunlees and Charles Douglas Fox were appointed as civil engineers, and the contract for construction was let to Clarke Pruchard and Co. The first sod was cut at a special ceremony held at Little London, in Southport, attended by the Mayor, Alderman Squire JP, on 18 April 1873. From the start the WLR project struggled financially and, although construction started successfully, it stopped abruptly when the contractor faced financial difficulties. A further WLR Act of 1875 authorised the raising of a further £187,500 and granted an extension of time for the line’s completion. A new contractor, Barnes & Squire, was appointed, and work resumed. facilities were in a single-storey brick building on what would become the down (Preston-bound) platform, west side of the line. The building was L-shaped, with a canted bay looking out onto the platform beneath a gable-end and there were round-headed door and window openings. Adjoining this building was an open-fronted waiting area, with a small verandah carried on wooden posts and curved braces. A simple brick-built waiting shelter was located on the up platform. There was a goods yard and shed on the up side of the line. On the down side there was initially a single siding. A signal box was north-west of the station on the down side. At the time of opening Crossens was served by trains between Hesketh Park and Hesketh Bank, but on10 June 1878 the line was extended southwards to Southport Windsor Road. company chose Crossens as a suitable location. The WLR completed the route to Preston on 6 September 1882, and from this date trains started to run from Crossens to Preston. To coincide with the completion of the route the WLR opened the new Southport Central terminus at the southern end of the line. A WLR Board minute of 16 August 1893 recorded that the carriage shed was to be extended to accommodate twelve additional new coaches. This extension made the carriage shed 260yd long - a large installation in what was at that time a rural location. In September 1896 an additional down siding was provided at Crossens to serve the Churchtown Industrial Cooperative Society. It came into use after 1 October 1896. On 1 July 1897 the Lancashire & Yorkshire Railway (LYR) took over the WLR. 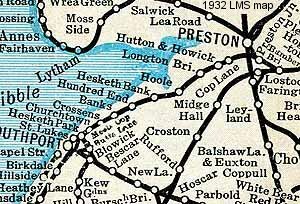 From 16 July 1900 they closed the WLR Preston station and diverted trains into Preston’s main line station. Southport Central closed on 1 May 1901, and all WLR line trains were diverted into Southport Chapel Street. The Churchtown Industrial Cooperative Society relinquished the use of their facility and it became an LYR general purpose siding from 24 May 1901. At about the same time the original goods shed was demolished. introduced electric street trams to the northern suburb of Churchtown (the next station south of Crossens) on 11 August 1901, and they competed directly for passenger traffic on that section of the Crossens line. The live rails had reached Crossens by 28 February 1904. On 6 March an electric train was run from Crossens to Liverpool, and a full public service began on 5 April 1904. Initially Crossens was served by trains that ran non-stop between Liverpool and Southport and then called at all stations between Southport and Crossens. The electric services arrived at the Preston direction (down) platform and set down their passengers. They then continued towards the north-east for a short distance to a crossover. The driver would then change ends and draw the train into the down platform ready for departure to Southport. This was facilitated by a new signal box which opened on the south-east side of New Lane level crossing, on the up side of the line. It was 320 yd north of the original signal box, which closed as soon as its replacement was ready. As part of the new signalling layout the down siding was extended northwards and had a new connection to the main line closer to the new box. A ground frame was installed on the up side to control a new connection to the up side siding; it was situated immediately north-east of the up platform. The station also still had its Preston services. direction platform, at the northern end, when an electric train was already present at the southern end. This arrangement allowed passengers who arrived from Tarleton to walk a short distance along the platform to join the electric train to Southport. The railmotor was not a success and was withdrawn on 1 October 1913. On 1January 1922 the LYR was absorbed by the London & North Western Railway but a year later that company became part of the London Midland & Scottish Railway (LMS). By November 1925 a third siding had been added in the down goods yard at its furthest point from the main line. The down yard then had a capacity of 36 wagons. East Lancashire District’. The first departure from Crossens was for Preston at 5:59 am. The last was for Southport at 11:13pm. 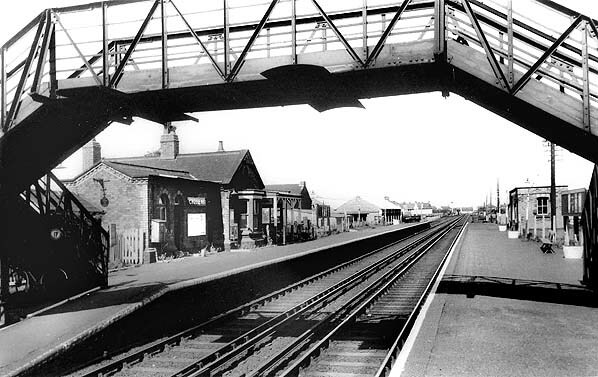 At some point during the LMS era a footbridge was added at the southern end of the station. Electric lighting on iron standards was also installed in the inter-war years. Accrington and 54 services to Southport Chapel Street; 34 of the Southport services were electrics that had terminated at Crossens and then returned to Southport Chapel Street. Electric trains to and from Southport ran via Meols Cop, where they reversed. Crossen’s signage was modernised after 1956 when LMR totem signs and complementary running-in nameboards were installed. Railway Magazine (July 1959) reported that the LMR was considering closure of a number of lines and stations by the end of that year, including the steam-operated route between Crossens and Preston. Some of the threatened closures did take place (including Hundred End station on the Preston line in 1962) but Crossens was not affected. By 1962 the down yard had been reduced to two sidings and the carriage shed was no longer connected for rail purposes. It is not known when it ceased to be used as a carriage shed, but it was still listed as such in a track diagram of November 1925.
effect from 7 September 1964, and Crossens station closed completely; the goods yard had recently closed, on 30 April 1964 (the down sidings were disconnected on the 6 July 1964 and had been lifted before September. 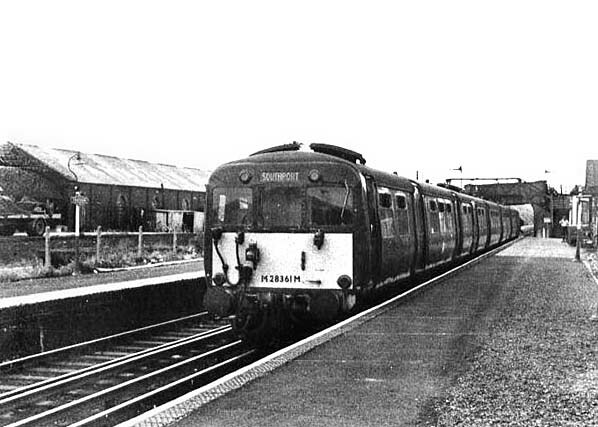 The up sidings were disconnected on the 19 July 1964). On the same day the down line through the station was closed between Hesketh Park and Whitehouse West Junction Preston, and the up line was closed between Penwortham Ground frame and Hesketh Park. On 5 January 1965 ex-LMS locomotive 44757 with 15 empty wagons passed through Crossens station on its way to Long Lane Crossing, north of Banks, in preparation for track-lifting, and work began the next day. The down line through Crossens had been lifted by 20 January 1965 and the up had gone by the end of March 1965. The station itself survived in a derelict state for a few more years but was demolished in the late 1960s. 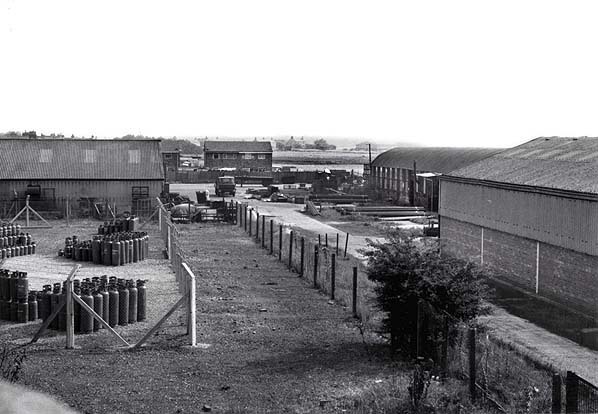 The site was then developed first for industrial use and then much later as a residential area. The original WLR Carriage shed survived in a derelict state until the late twentieth century. It was demolished to make way for new apartments. Tickets from Michael Stewart except 1694 Alan Castle & 362 Les Fifoot, route map drawn by Alan Young, Bradshaw from Nick Catford. 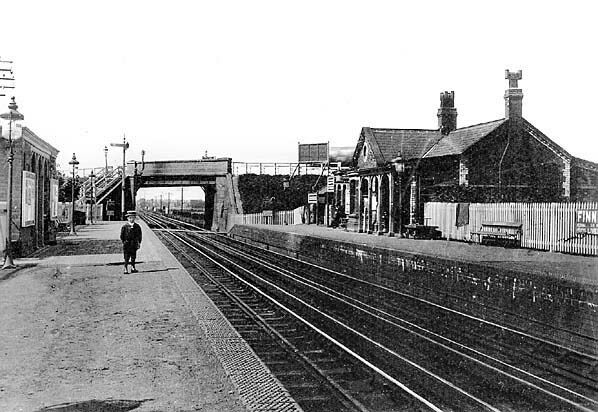 Crossens station looking south-west from the up (Southport-bound) platform in 1878 when the first section of WLR between Hesketh Park and Hesketh Bank had opened. 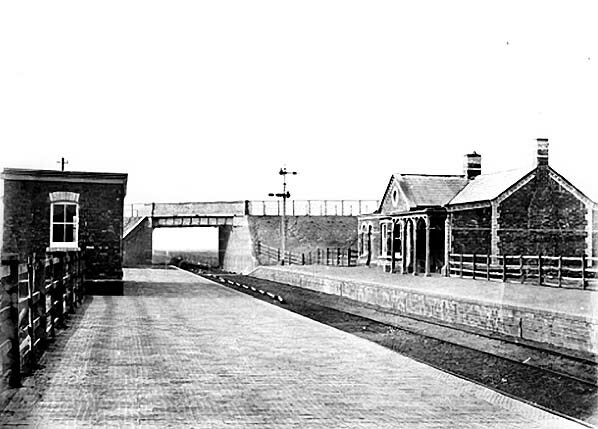 Crossens station as it was in 1894 whilst still part of the WLR. The original Crossens carriage shed of 1881 is shown as the southernmost large building on the map. The area was surveyed before the carriage shed was enlarged some time after August 1893. By 1928, when Crossens was part of the LMS, facilities had been extended. The carriage shed had been extended in late 1893 or early 1894, and its enlarged form is shown on the map. Note the massive Vulcan Motor Works to the left which was never rail-connected. Looking south-east along the Southport-direction platform at Crossens station early in the 20th century. 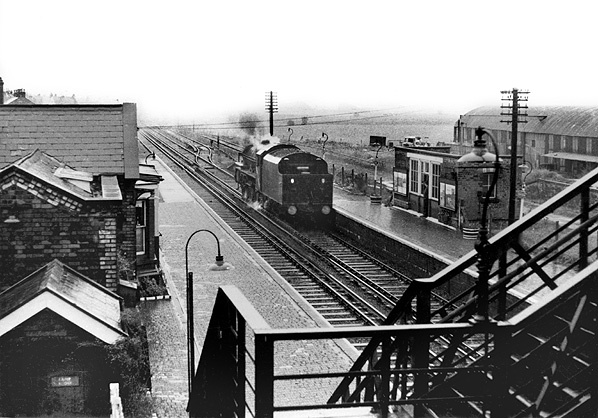 Crossens station looking north-east from the road overbridge in 1949. 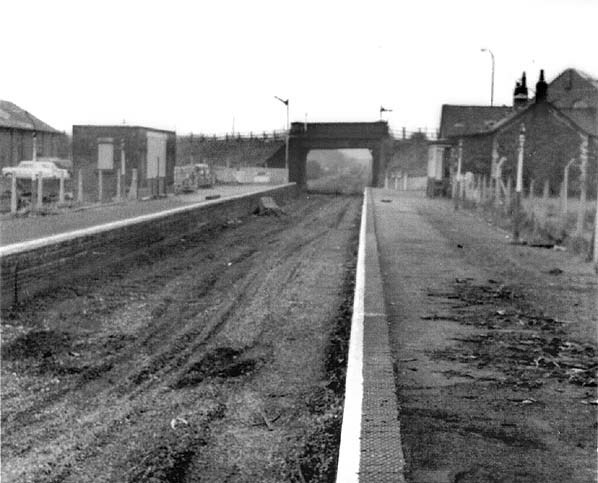 The New Lane level crossing can be seen in the distance; this was the limit of the electrified line. The live rails continued through Crossens to New Lane for the sole purpose of allowing the EMUs that arrived from Southport Chapel Street to change from the down (towards Preston) to the up (towards Southport) platform. Passengers for Southport could join the train only on the up platform. A Preston to Southport service arrives at Crossens station in 1957. The picture was taken from the station's footbridge and is looking north-east. To the far right can be seen the original WLR carriage sheds. An EMU in the northbound platform at Crossens station c. early 1960s. The train will continue north for a short distance before reversing into the opposite platform to pick up passengers before returning to Southport Chapel Street. The carriage shed is seen on the far left. 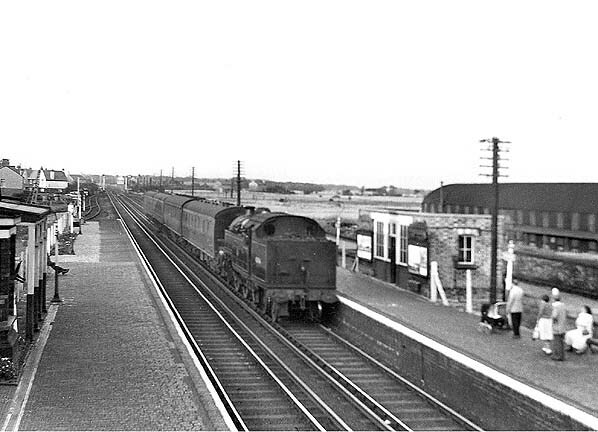 Crossens station looking north-east along the Southport platform in June 1963. Electric services from Southport terminated at Crossens. They arrived at the Preston platform and after setting down passengers they continued towards Preston for a short distance. They then reversed, pulling back into the opposite platform. Having, earlier in the afternoon of 5 September 1964, been a rare and unexpected visitor to the line, after turning up at the head of the 12:44 pm Southport - Preston, 'Jubilee' 4-6-0 No 45642 'Boscawen' has curiously then been returned light-engine directly back from Preston station to Southport, specifically to work the later 5.32 pm. Southport - Accrington. In this view the locomotive has been captured passing at speed through the rain-swept and deserted platforms of Crossens. The loco was built at Crewe Works for the LMS in May 1934. This 3 cylinder Jubilee was designed by Stanier and had a working life of over 30 years, being withdrawn on 9.1.1965 and cut up in April of the same year by Wards of Kilamarsh. Particularly notice the electric lamp installed on the footbridge stairway, apparently adapted from an old gas-light fitting. On the West Lancs line there were none of the fluorescent strips and sodium floodlighting later to become commonplace as part of the corporate identity (and, arguably, bland) 'British Rail' image. At its death this was essentially a Victorian / Edwardian railway replete with much original and very attractive regalia that exuded so much individual character. 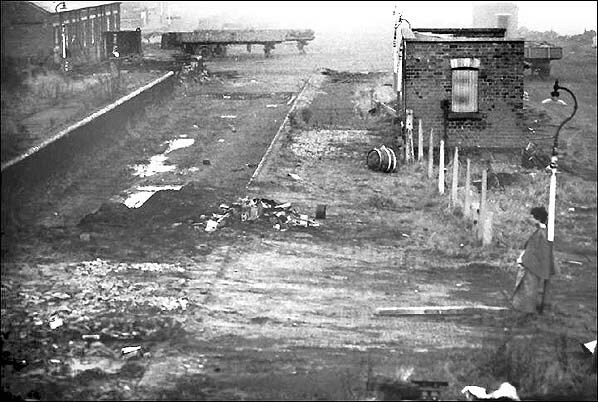 Crossens station looking south-west from the north-eastern end of the down (Preston-direction) platform in March 1965. The track had only recently been lifted. 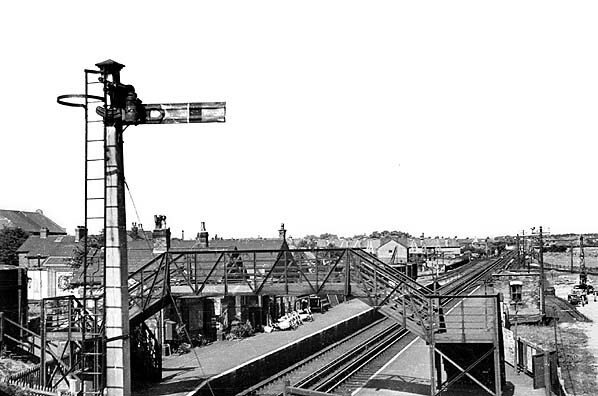 The up (Southport-bound) platform (right) c mid 1960s. be seen to the right. The site of Crossens station looking north-east in August 1984. By this date there was no trace of the station, and the site had been redeveloped for industrial use. 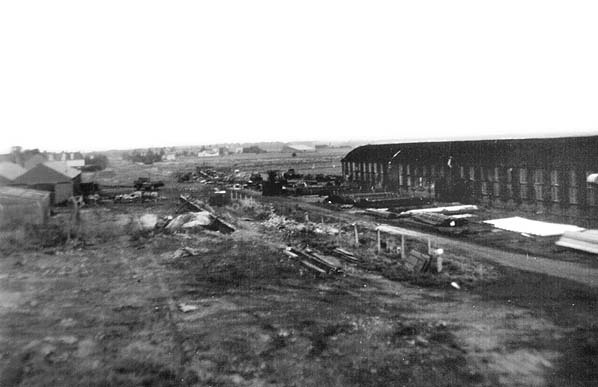 However the WLR carriage shed was still standing and can be seen in the middle distance to the right. The site of Crossens station looking north-east from the site of the road overbridge in July 2011. After closure the station site had been developed as an industrial area and later this was replaced with housing.